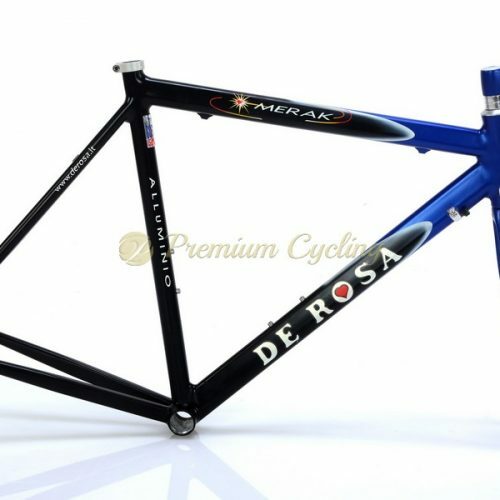 Here we are offering a classic DE ROSA Neo Primato frameset. The frame is work of art, made of Dedacciai Zero Uno tubing, famous ”Diamante chainstay” and DeRosa marked dropouts. It has both the sought-after feel of steel and the look of the golden era of cycling. In these days of weird-shaped bulging carbon tubes, an elegant, slim frame with classic clean lines suddenly looks beautiful again. For added authenticity, the Neo Primato comes with a steel fork – a rarity on a modern drop-bar bike. No much words needed. Ready to be build. Fair price. Condition: Used, but good condition. No cracks, no dents, not bent. Some tiny signs of normal use.